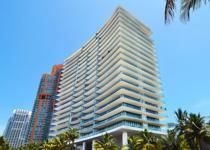 Completed in 2008, Apogee South Beach is one of South Floridas most luxurious condo development. Apogee South Beach consists of 67 well-appointed condo residences each with flow-through city and water views. Developed by The Related Group of Florida and designed by Sieger-Suarez, Apogee South Beach gives a whole new name to luxury. Sq Ft Range: 3,103 - 4,154 Sq. Ft.